I have been bitten by the pellet stove bug for sure. As evidence for this I ordered my Harman XXV cast iron pellet stove, from Bernardston Farmers Supply, 2 months before we moved into our new house. My friend Bruno, who is all knowing when it comes to pellet stoves, showed me his stove and this had me hunting for my own. We settled on the Harman XXV stove since it fit all our needs. We where looking at something to heat our entire house, which is approximately 1900sq ft. The stove would be installed on an existing pad in the finished basement which once held a wood stove. Cast Iron was preferred since visually it looked like an old fashion. The hopper had to be big enough to run all day without refueling. Eventually our choice of pellet stoves narrowed between the Quadra-Fire MT Vernon and the Harman XXV (pictured to right). After getting quotes from several places we went with the Harman XXV. With installation and a free ton of pellets from Harman the price difference between the 2 stoves was well over $1000, so the Harman was the logical choice. I can honestly say that purchasing a pellet stove is #1 on our list of best purchases for our home. Approximately 3 months in and we have used ZERO oil to heat our house. Our house is toasty warm, always between 68-75 depending on the room. Low maintenance, a quick vacuum of the ash and a wipe of the glass. Does not get burning hot like a wood stove, much safer for my child. Fan noise can be heard when the stove is on high (we don’t even notice it anymore). As for if the stove would save us money, it all depends on how you look at it? I filled my 1/4 full oil tank and it was the same cost as 2 tons of pellets delivered (our hot water uses oil for NOW). These two tons of pellets have kept my house nice and toasty during the worst of winter for going on 2+ months. I very much doubt I could say the same if using oil. I am sure if we kept the house at the temperature we would have if we where heating with oil we would save money. One of the main reasons we got our pellet stove is to not have a freezing house especially with a little one. Having a house in the low 70’s in the dead of winter was great. With the heating season officially over I am sure glad we had our stove. It really came in handy on some of those days in April when Vermont decided to drip back into the 30’s for the day. It was nice to just fill the hopper, and have a toasty house in a short amount of time. One thing we did notice, when the outside temp towards the end of the season was 40 or so, the Harman XXV kept the house very warm and went through very little in the way of fuel. The maintenance during this time of slow burning through fuel was very minimal which was great given our busy schedule. Fuel wise, we went through 3 tons of pellets plus maybe 20-30 bags which we bought a few at a time during the end of the heating season. In retrospect, we probably should have had another ton delivered, but buying it by the bag isn’t too bad. Still have plenty of oil in the tank, and hopefully it will be that way this time in 2011. September 9, 2010 update, more area to heat this winter. As the heating season quickly approaches we are expanding what we heat with our pellet stove this year. Plans are in the works to run some ducts out to an attached sunroom. Our hope is to install an inline duct fan and draw the heat from near the pellet stove and make the sunroom more usable during the colder months. This may have an additional benefit of circulating some heat in our house more, though our layout is very good for natural air moment. Judging from last year, I am confident the Harman XXV is up to the task! On the Oil front, it’s close to being official, we are approaching a year without using oil to heat our house. On the pellet front, had a delivery of New England Brand pellets which are made close by in NH, can’t get much more local then that. Hi Kris. Great post about your Harman stove, including the pros and cons! Would you mind contacting me via email at jgoetz@hearthnhome.com? Thank you! I just found this site today. My wife and I recently purchased and installed a Harman XXV. The stove is great. It’s heating my 1900 square foot home like a champ. We recently bought our home at the end of October 2010….this was a smart move on our part seeing that our home was previously heated with propane! Here is an idea…maybe there can be something on your site regarding the TAX benefits for using alternative heat? Yes there is the bio-mass / energy efficiency credit that you can also get. We ended up getting about $1200 back for buying it which was great. Thanks for posting this, it is really helpful. I currently have a Mt Vernon in my downstairs family room and would like to add a stove in the upstairs living portion of the house. I was thinking either another Quadrafire or a Harman, and i really like the look of the XXV. the XXV now comes in an enamel too, besides the cast iron. One of our friends got the enamel one and it looks super sweet. I personally think the XXV looks great in “living area” and with the optional stove pipe addition, looks more like an old fashion wood stove which adds a lot of charm. it was interesting reading your post. Being a pellet nuts I owned Harman P68 (paid $2500 in 2007) which unfortunately was left in the house we sold 2.5 years ago as part of the deal. Just bought another house and I am back in the market for pellet stove. I wonder if you can tell how much you paid for the XXV? If for some reason you don’t want to advertise it publicly I will highly appreciate if you email me at varsenov@gmail.com. I was thinking I need to put a post about the cost of it now that I am nearing the 2nd full year of operation so I will do that. If there is anything else you can think of let me know. Been researching till my brain HURTS! We bought a house 8 years ago with a Whitfield Renaissance pellet stove & have used it 24/7 from Oct-May for those 8 years. This past week, we fired it up & it seems the control panel has issues 😦 Without ANY budget any time to purchse a new stove… we are now in the market. We have an issue with the size as the area is not big. We must have top vent & I want to be WARM. We’ve narrowed it down to the Upland 207 Pellet Stove OR the Harman XXV. Your site has really helped me… I am SO TIRED of being COLD in the winter! Can you tell me what you paid? I am not able to find a price on pellet stoves ANYWHERE online & I live on an island in Alaska with only 2,800 population… which brings up another point- we would have to install ourselves? Do you think it seems difficult with this stove?? Look at the first post I did about the XXV, I believe I put a price in there. Even go through a lot of pellets when way up is so much cheaper then heating with oil and such. I didn’t see where you indicated a purchase price on your initial post but I just bought my XXV today and paid $3,649 after negotiation. I am also a Vermonter and I’m looking forward to a warm cozy house finally. I was not as lucky as you, however. Harmon did not through in a free ton of pellets and the energy efficiency credit no longer exists. 😦 Doesn’t matter though, I’m betting it’ll be worth every penny! I would have to 2nd you in saying it is worth it. Thinking about how some people are almost paying $4 a gallon for oil, and pellet prices still are the same, it seems well worth it! I think the price is listed on my first post somewhere. 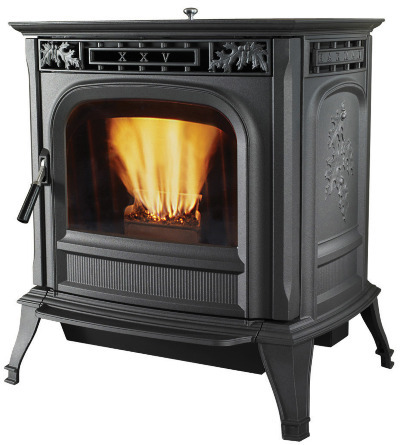 I have mostly praise for the Harman XXV pellet stove that has been heating our home for the last 2 1/2 heating seasons. However this present heating season the combustion blower motor died for no apparent reason other than it was a bad apple. The company tried to blame it just about anything else. The replacement cost $115 and comes with what amounts to no warranty at all, unless you call 90 days a warranty, a year would have been more reasonable. If the blower dies the first day of the next heating season we will be out of luck, warranty and $115. Our fingers are crossed as we hope that the original blower motor was the exception rather than the rule.